These compact folding trucks are very easy to use. 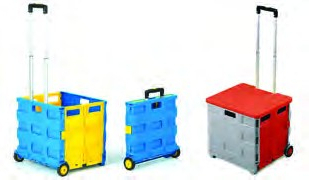 Made of durable moulded construction they fold flat for easy carrying and storage. Load Capacity: 35kg. Folded (mm): 470H x 460W x 85D. Open (mm): 990H x 460W x 390D. There are currently no questions for GPC Folding Box Truck With Lid - be the first to ask one!